You probably know that most South Pacific islands were created by volcanic activity. But volcanoes aren’t just the stuff of history books. A while back, I told you about the birth of a new island that was captured on film. 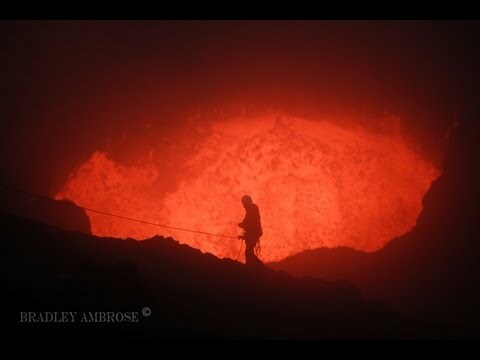 Today I want to tell you about a few active volcanoes that you can experience up close and personal. Visiting a volcano is unlike any other experience in the world! The air around a volcano is very hot and incredibly loud. Recently I visited Mount Yasur, and standing at the ridge of the volcano I could have sworn a jet was taking off right over my head! You’ll also want to be sure not to wear rubber or plastic soled shoes, because even the rocks beneath your feel can get hot enough to melt right through. Mount Yasur (Tanna, Vanuatu) is one of the most active volcanoes in the world, and the most accessible. You don’t have to be a professional mountaineer to walk the path to the edge and peek in. You’ll see a golden, roiling mass — like looking straight to the center of the earth! The local indigenous people have many stories about Yasur, and they see it as a sacred place. If you have the chance to experience its powerful presence, you’ll probably agree! A few islands away from Tanna lies the island of Ambrym. This island is similiar to Tanna, mostly covered in dense rainforest, with an active volcano at its heart. This volcano has two distinct craters, called Benbow and Marum, created around 50 AD. That’s a long time ago! The last time the volcano erupted was in 1913, but scientists are predicting new activity any day now. Yikes! The final volcano I want to tell you about is also one of the most unique. Mount Gharat looks like a regular volcano — a peak rising dramatically out into the air — except for the fact that it is surrounded on almost all sides by a giant crater lake. 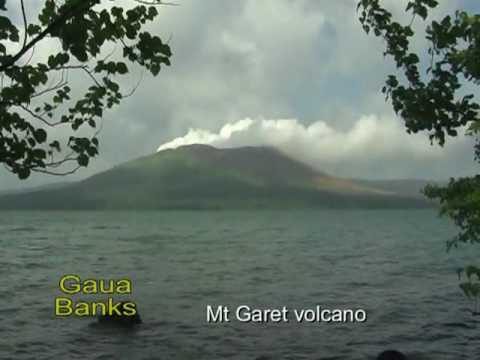 Lake Letas is the largest lake is all of Vanuatu! Is it a stunning sights. You won’t be surprised to find that it is, of course, very warm. Mount Gharat last erupted in 2011, as you can see in this satellite image. Volcanoes are beautiful, but they are also dangerous. The local government of Vanuatu has a ranking system to establish whether it is safe to visit their volcanoes. I recommend you take this very seriously! Radio NZ reported last week that Yasur has been raised to Level 2 (Moderate to high activity, lava bombs may land beyond the crater rim, access to the crater is closed). This means that for the time being, I’m afraid you can only see this magnificent natural phenomenon from a distance, rather than close up.